Though I have mentioned it on Twitter, I don’t think I’ve told you all that I’m currently house sitting for Shane’s parents. The past few times they’ve gone away they’ve asked me to watch their house, and I know they think I’m doing them a favor, but really, it’s not a hardship for me. They’re close to the beach, they have cute kitties and they’ve got double (or more) the counter space I work with at home – what’s not to love? Actually, here’s the one downside: not enough people to foist treats on. I can’t send things to work with Shane nor can I easily pass them along to my mom, and since I don’t know any of their neighbors I don’t feel terribly comfortable trying to give my baked goods to them (I know I wouldn’t want to accept food from a stranger if it were me). The problem is compounded by the fact that I bake a TON while I’m down here – the extra counter space calls to me, practically begging me to get in the kitchen and use it while I can! So, when I chose to make these biscotti, I had a few things in mind. First, the biscotti keep in the freezer for a month, which means I can wrap some of them up and leave them for Shane’s parents, who can enjoy them at their leisure when they get back. Even at room temperature, the biscotti will still be yummy in a week, which makes them perfect for shipping to friends (so I did!). Finally, and you may have already noticed, these biscotti combine chocolate and peanut butter, and lately I can’t get enough of that combination – I’ve made no fewer than 3 desserts combining the two in the past week. I adapted this recipe just slightly from Gourmet to include peanut butter chips instead of walnuts, the perfect complement to the fabulous, intense chocolate flavor the biscotti get from a healthy dose of cocoa powder and chocolate chips. I ran into neither of the problems I often have with biscotti recipes – too crisp (I don’t like to dunk my biscotti) or too crumbly when cut (a chef’s knife sliced them perfectly) – so this recipe is a definite keeper for me. I almost used the remainder of my mint chips in this recipe instead of the peanut butter chips, so it’s safe to assume it won’t be long before I make that version. Side note: I made the biscotti late at night so all of the photos were taken with a Speedlite flash, which is such a cool toy, if only I knew how to get consistently good results using it… I’m not big on reading instructions when it comes to these things, I’m more of a trial and error type of person. There’s probably something to be said though for spending a few hours reading an instruction manual instead of wasting time taking 150 photos of one dessert only to wind up with 2 usable shots. In a medium bowl whisk together the flour, cocoa powder, baking soda, and salt. In the bowl of a stand mixer fitted with the paddle attachment, cream the butter and sugar on medium speed until light and fluffy, about 2 minutes. Add both eggs to the mixer bowl and beat until well combined. With the mixer on low speed, add the flour mixture, beating just until combined. Finally, put the chocolate and peanut butter chips in the bowl and pulse the mixer a few times to evenly distribute the chips in the dough. Divide the dough in half. On the prepared baking sheet, form each half into a slightly flattened log about 12 inches long and 2 inches wide. Sprinkle the logs with confectioners’ sugar. Bake for 35 minutes, or until the logs are slightly firm to the touch (they will likely crack a bit on top). Remove the baking sheet from the oven and let the biscotti cool on the baking sheet for 5 minutes. Transfer the logs to a cutting board and use a large knife to cut the biscotti diagonally into 3/4-inch slices. 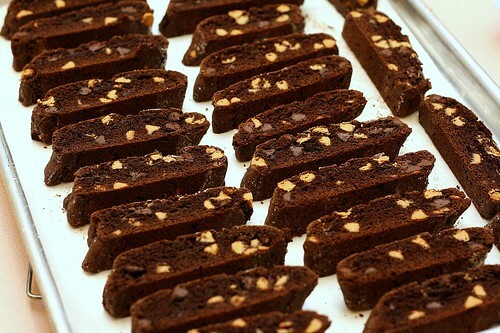 Arrange the biscotti, cut side down, back on the baking sheet and pop back into the oven until crisp, about 10 minutes. Remove the biscotti to a wire rack to cool completely. Biscotti keep in airtight containers 1 week and frozen, 1 month. 23 Responses to "Double Chocolate Peanut Butter Biscotti"
These look so delicious – I love the combo of chocolate & peanut butter. I’m a big fan of the whole chocolate and PB combo lately, too. I generally am not a lover of biscotti, but your description of these sounds just about perfect to me. I can’t wait to try them out, and how nice that they ship well, too. Especially with Father’s Day right around the corner . . . I didn’t know biscotti kept for so long. I love learning something new. Thanks and have a wonderful week. 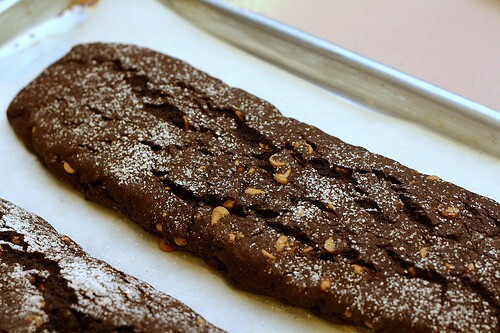 I could definitely go for one of these biscotti dipped in my coffee right now! Yum! oh these look great! my mom LOOOOOVES biscotti! peanut butter, not so much (sometimes i think i’m adopted ;P ) so i’ll sub them for mint chips, the original walnuts or even butterscotch chips. yum! First of all, I must make these when I get home. Second, I’m sure Shane’s parents would be happy to tell the neighbors that their visiting daughter-in-law would be pawning off delicious baked goods and they would welcome you with open arms, and third, I am 100% like you–I would rather take 150 photos than read the instructions. This is my kind of biscotti! YUM! yum. I might try making these. I haven’t been much of a baker in the past, but I am starting to like it a little bit! Whoa – these look amazing, Tracey! I might have to see if I can housesit for Shane’s parents too so I can rummage through their freezer and look for these! 🙂 These would be seriously dangerous around here. It’s been a while since I made biscotti and this is definitely next on my list!! I have never made Biscotti but this recipe could be my first. Love chocolate and PB, such a great combo. By the way the kitty cat is adorable! Sounds like a nice little getaway for baking inspiration, a nice view and good company. I have always loved peanut butter and chocolate combination! They tastes perfect together! They look awesome! I never get tired of peanut butter and chocolate. Fun biscotti. I love biscotti more than I ever knew I did just a few years ago. Those look delicious! Peanut butter and chocolate is such a satisfying combination. Sounds like a a wonderfully relaxing place to housesit. I’ve had a speedlight flash for six months now and have yet to read the manual. Thanks for the reminder that I actually could be taking decent photos at night! I’m with you…whenever I find myself in a kitchen better and bigger than my own (not hard to do), I have the urge to bake! Good call on the biscotti! As the lucky recipient of some of this batch, I have to attest to the fact that they are DIVINE!! I can’t wait for my parents to come into town tomorrow because otherwise I will easily eat the entire batch!!! So much for my diet! I’m defenseless against these! Your biscotti look perfect! Mine never turn out quite right, so I haven’t made any in a very long time. Now I’m feeling inspired to give them another try.